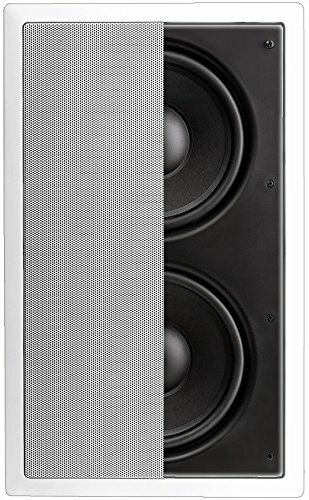 With Dual 8" Injected Polypropylene Woofers, Bigger Magnets and 350W of power handling, the IWS-88 In-Wall Subwoofer performs excellently for home theater surround sound applications as well as for listening to music. Like all OSD Audio speakers, the IWS-88 includes a dog-ear bracket system that mounts securely to the sheet-rock after the cut-out hole has been made and the speaker has been dropped into the hole. The grille is paintable to match your room decor and we even include a cutout template that doubles as a paint shield. You'll experience thunderous, room-filling bass without filling up floor space. Because this is a passive speaker, it will require a subwoofer amplifier to power it. An ideal match to this subwoofer is our OSD SMP250 (B002BLSM9M) dedicated subwoofer amplifier that features 150 watts (mono) and front panel controls, Phase switch, Frequency Control Knob (35 Hz to 180 Hz) and Volume control. Cut-out Size (WxH): 10 1/4" x 17 3/4" || Mounting Depth: 3 9/16"